In a recent article appearing on the website WalletPop, author Zac Bissonnette bemoans the downfall of Hummel Figurines as attractive and popular collectible items. It seems that the adorable figurines, first collected in the 1930’s by GIs overseas in Germany for family and friends at home, have lost their desirability among collectors. Bissonnette sites renowned antiques and collectibles aficionado Terry Kovel as stating that the value of the once highly-sought-after Hummel pieces has for all intents and purposes landed in the toilet. She attributes the downfall, at least in great part, to the Goebel company’s desire to artificially create and enhance the secondary market for the collectibles when they began to manufacture “limited edition” Hummel pieces during the 1970’s and 1980’s. Now it seems, not only are everyday people not collecting Hummels (at least at the rates and higher prices they have in years past), but the collectors aren’t buying either. As a result, the value of the pieces has plummeted, leaving them worth a mere fraction of their previous values. That’s one reason why it’s always smart to collect what you like rather than to collect strictly for investment. Markets can be fickle and highly susceptible to change; and those changes may not result in your financial favor. 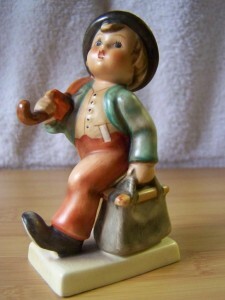 So, if you like really cutesy boys and girls dressed in outfits from years ago, now might be the best time to buy Hummel figurines or keep those you’ve found stashed away in Grandma’s closet. But if you’re looking for somewhere to put all your hard-earned investment dollars, you’d be well-advised to look somewhere else. And give grandma’s cherished box of Hummels to some deserving boy or girl who will appreciate them.